Now you can try your hand at apron embroidery. Aprons use to be made from plain material and they were very plain. They were made for keeping your clothes clean while you were cooking. People didn't care how pretty they were. They just needed to be practical. Aprons have now evolved from just a plain old apron into something that you donâ€™t mind people seeing. You can make them from fancy material and they will still protect your clothes. They are so much prettier now and you can do so many special things with them. Now dayâ€™s even men wear aprons to cook in the kitchen as well as to BBQ. They like to have a nice apron with a design on them just like women do. Embroidery designs come in many different styles. You can find designs for holidays, flowers, animals and many different designs. You can find many styles and colors to fit any personality. You will find whatever you are looking for at your favorite craft stores or online. Apron embroidery has advanced into fashionable apparel for the kitchen and you can even personalize them to your own taste. 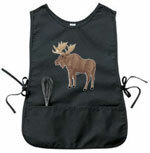 Aprons are a very memorable and practical gift. People love them and you can make them to fit their personality. Most Grandmothers love to cook so make her an apron with flowers on it. 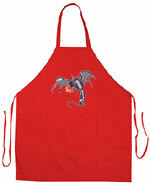 If you were making an apron for a man who loves to cook you would need a design a little masculine. No matter who the recipient is, you can definitely find apron embroidery designs for them. I have found quite a few designs on the Internet that I loved. Just put a search in for embroidery designs. If you have an embroidery machine you can make the design real fast. I donâ€™t happen to own an embroidery machine so I do them by hand. Some people even appreciate these gifts more because it really has a personal touch. You can also find embroidery shops that will do your design for you if you would rather not do it yourself. For the aprons themselves, you can purchase them at many different stores or else you can make them. There is so much pretty material that you can get just about any design that you want. With some material you wouldnâ€™t even have to embroidery them. Donâ€™t forget the kids. They love them with a design and their names on them. Disney characters seem to be the favorite for younger children. Older children like a more grown up design on them. If you are making the aprons for gifts or just for yourself they will brighten your day just having something pretty to wear in your kitchen. Have fun making them!